Ford used to count heavily on the Edge crossover to become the king of the urban jungle with its cool-guy looks and seemingly endless customization potential. But the market didn’t really embraced this idea well! 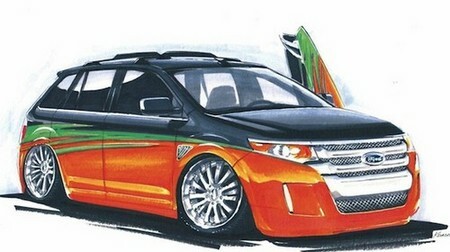 Anyway, now the new Edge has a chance to redeem itself at 2010 SEMA show. Here’s a job by K-Daddyz Kustomz, which gets gets 22-inch wheels with radically lowered suspension. This Edge is ready to cruise the coast, with a custom paint scheme featuring airbrushing and pin striping, along with a custom surfboard rack and panoramic sunroof. The leather and suede interior comes with Dual Head restraint DVD by INVISION.